Influenza virus and a few other viruses have segmented genomes. Most viruses carry their genetic information on a single piece of DNA or RNA, but influenza has 8 pieces. You can think of this as analogous to our chromosomes: we have our 20,000 genes spread out over 23 chromosomes. Each chromosome is a separate piece of very long DNA. Influenza has 8 genome segments (we don’t call them chromosomes for viruses) to encode its 11 genes. Having a segmented genome presents a unique problem for the virus. At the end of a viral replication cycle, new virus particles must be assembled from the individual components. That usually involves assembling a capsid with the genome packaged inside, and picking up an envelope. Its complex enough to get all the components together in the right place, in the right amounts, at the right time. Influenza has the problem of needing to get 8 pieces of RNA packaged instead of just one. And it cant be any 8, it has to be one of each, otherwise the virion would not carry a complete set of instructions to successfully execute the next round of infection. So influenza must somehow collect its 8 segments to package into the virion. When I took virology as an undergrad, I remember very clearly this problem because nobody knew how it worked. What? A major step in the replication of a major virus and we don’t know how it works? Virology suddenly seemed so exciting because there were major unanswered questions. Apparently its a hard one to answer since the details are still unknown but a strong picture is emerging from a growing body of research. Two models have been proposed for how influenza assembles its 8 RNA segments. One, the random incorporation model, suggests that 8 randomly selected viral RNAs are packaged. This would result in most particles being defective, since the chance of selecting one of each is quite low. I’ve never been fond of this model, as it just seems too inefficient. The selective incorporation model, on the other hand, proposes that during the assembly process there is some way to select one of each genome segment. A few studies over the last few years have advanced our understanding of the process. First, some very high quality electron microscopy revealed that the genome segments are packaged in a very specific arrangement with 7 segments in a circle surrounding 1 in the middle. Think of each segment as a dowel, bunched up lengthwise. Each segment is a different length, and each of the “dowels” in the electron micrographs appear to be different lengths, suggesting that each one is unique. Another study used a single molecule fluorescent labeling technique to show that one and only of each of the segments is packaged into the virion. Using rather amazing microscopy, in which a single RNA molecule in a single virus particle can be detected with a fluorescent probe, they were able to show that the majority of virions carry one copy of each of the 8 segments. Several other studieshave identified unique packaging signals in the nucleic acid sequence of each genome segment. These packaging signals would serve to associate the genome segments with each other and with other components of the assembling virion. Each one of these studies has potential problems that make them, on an individual basis, insufficient to nail the coffin shut on the random incorporation model. For example, the 7+1 arrangement is only seen in a small fraction of virions. Is it because only some have that arrangement or is it that the preparation of the samples for electron microscopy distorts some particles? This question of how influenza packages its genome serves as a terrific example of the scientific process and the necessity to generate a large body of work to figure out what may seem like a simple question. In class, we talk about designing experiments to test a hypothesis, but tend to see examples of one experiment that really nailed it. It doesn’t usually work that way. You typically need many different experiments, approaching the problem in different ways, because any single experiment could have a valid critique that weakens the conclusion. The whole body of work must be considered, and in this case the body of work appears to be supporting the selective incorporation model. At last, one of the papers investigating H5N1 influenza transmission in ferrets has been published in the journal Nature yesterday. To recap the controversy briefly: news of experimental studies investigating transmissibility of avian H5N1 influenza hit the news this fall, igniting a fierce debate about biosecurity, “dual use” research, and the damage that censorship can have on scientific advancement. An advisory group, the NSABB, recommended partial censorship of the data, perhaps believing that redacting specific data from the publications would prevent information on how to generate a highly pathogenic mammalian transmissible virus from getting into the hands of bioterrorists or others incapable of handling such viruses safely. However, after some new data or clarification of data presented in a revised version of the submitted manuscript, the NSABB recommended publication in full. Avian H5N1 influenza virus has caused sporadic infections in humans who have close contact with infected animals. Human-to-human transmission has not been observed. But could an H5 virus mutate or reassort, allowing human-to-human transmission? One thing that has been lost in this whole controversy is that this study is actually a great demonstration and application of evolution. How does a virus switch to a new host and transmit efficiently between individuals? Start with a diverse population that varies in a particular trait (in this case, ability to bind the human receptor). Put it through selective pressure. This occurred in several steps: first, select for viruses that can bind the human receptor in vitro. From those that bind, select ones that can efficiently replicate in the respiratory tract of the animal. Finally, take the efficient replicators and allow for transmission. At each step of selection, mutations that naturally occur during viral replication further diversify the population resulting in variants that possess the desired property. Those variants get selected for the next experiment. This study focused on one particular influenza virus protein, hemagglutinin (HA). HA is on the surface of the virion and is what the virus uses to attach to the host cell, the first step in viral infection. HA of human influenza viruses bind a sugar on the surface of human cells, which is slightly different from that found in the avian respiratory tract. Avian viruses, of course, bind to the form found in birds. H5 shows a strong preference for binding the avian receptor, so Karaoka et al were interested in finding out if H5 could change to recognize the human receptor, allowing more efficient transmission between mammals. To address this, they began with a mutagenesis technique to introduce random mutations in the globular head (the receptor binding part) of HA, then used an in vitro approach to select for mutants that bound the human receptor (selection step 1). Through this process they identified three H5 variants that gained the ability to bind the human receptor while maintaining the ability to bind the avian receptor, and one that switched specificity completely to the human receptor. Several of the mutations identified in this study had already been shown in previous studies to be important in receptor specificity. 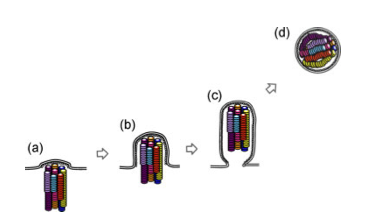 To test if the variant H5s conferred binding to human receptors in vivo, sections of human tracheal tissue were exposed to the viruses and only two were able to infect (selection step 2). This suggests the virus can infect human epithelium of the upper respiratory tract. Next, the two remaining variants were used to infect ferrets. Both replicated in ferret respiratory tracts, but one replicated to higher levels. When they sequenced the virus that they isolated from that ferret, it was different from what they had put in: a new mutation had appeared. This new mutation presumably confers the property of better replication in the ferret respiratory tract, so it outgrew the original input virus (selection step 3). Using this new virus (now with a total of 3 mutations in H5), transmission was tested in ferrets. Compared to the original H5, which did not transmit via aerosol, the 3-mutation variant did transmit, although between only 2 of 6 animal pairs. Again, they sequenced the virus that was present in the contact animals and found that it was different than what had gone in to the inoculated animals. Yet another mutation had appeared (selection step 4). This additional mutation appears to enhance transmission: the new virus, now with 4 mutations, transmitted more quickly and between more pairs of animals than the 3-mutation virus. Although the virus can transmit, none of the infected animals died, but they did show pathology at the site of infection. So what does this all mean? The best model available for influenza transmission studies is ferrets. Ferrets aren’t humans, so its important to keep in mind that this is a model that helps us understand what viral or host factors are involved in aerosol transmission in these mammals, and maybe, but not necessarily, in humans. Since we don’t know what is necessary for human-to-human transmission, it is valuable to have an animal model to give us some ideas of what to look for. It can provide some good hypotheses on what mediates transmission in humans, which would then have to be further tested. Obviously, specificity for the human receptor is necessary, but the mutations identified tell us more than that. Mutations that change specificity are not sufficient for transmission. It turns out that those mutations also decrease the stability of the HA protein. The additional mutations acquired through the selection steps compensate for that, and enhance stability. So now we know that HA stability is important in influenza transmission. Between ferrets. That’s probably true for humans too, but it would need to be tested. If you are still reading, you are obviously procrastinating, and are probably avoiding studying for your final exam. But here are some more thoughts on the controversy overall. This is a really interesting paper, with nothing particularly frightening or worrisome about it. Certainly not any more so than other papers doing similar work that were published without so much controversy. If “dual use” research needs to be regulated, it needs to be done before the work is done, not after. If the NSABB was concerned about this kind of research, why only express concern once the experiment succeeds? In my intro biology class, we read another paper, published in 2005, which was addressing the exact same question, in an almost identical way. The difference is that they failed to make a transmissible virus. If there is a concern about this kind of research, a concern that it is too risky to do these kinds of experiments, shouldn’t the alarm have been raised regardless of the outcome? It just doesn’t make sense to me why it suddenly became so concerning. If anything good has come of this controversy, it is the widespread discussion that this has stimulated on the importance of open communication of scientific data, the importance of not censoring in science. Ironically, had we all been given access to the data, like through a journal publication, it would have been apparent that there wasn’t anything to be concerned about. Schizophrenia is a severely debilitating mental illness with no known cause or cure, although there is a strong genetic correlation. Interestingly, there is additionally a significant relationship between season of birth and the development of schizophrenia, as individuals born during late winter and spring have a significantly increased risk for developing schizophrenia. One hypothesis to explain this phenomenon is that this is due to prenatal viral infection, which is more likely to occur in the winter months. It is hypothesized that viral infections occurring during the third trimester of pregnancy result in the increased risk for developing schizophrenia. However, there is currently debate as to how this happens- is it due to a direct viral infection of the fetus, or due to maternal cytokines in response to infection? A study by Faterni et al (2012) found that the placenta may be a site of pathology in viral infections. Using pregnant mice infected with a sublethal dose of influenza on the seventh day of pregnancy (E7), they found that viral infection resulted in many histological abnormalities in the placentae. These abnormalities included an absence of the labyrinth zone, the region of the maternal placenta in which nutrients and oxygen are exchanged between the maternal and fetal blood, the presence of thrombi, and an increased number of inflammatory cells. Additionally, microarray analyses revealed a significant upregulation of 77 genes and downregulaton of 93 genes in the placentae of infected mothers, compared to sham-infected mothers. 20% of these altered genes were involved in apoptotic or anti-apoptotic pathways, 10% were associated with immune response, 11% were involved with hypoxia, and about 11% were involved with inflammation. 9.4% were associated with major mental disorders including schizophrenia, bipolar disorder, major depression, and autism. All of these changes could potentially affect developing embryos. The deletion of a labyrinth zone could result in a reduction of oxygen delivered to the developing fetus and result in neural abnormalities, which may be ultimately caused by an inflammatory immune response. The authors also analyzed gene expression in the hippocampus and prefrontal cortex of the offspring of infected mothers. Compared to offspring of sham-infected mothers, they found 6 upregulated and 24 downregulated genes in the prefrontal cortex at the first day after birth (P0), and 4 upregulated and 13 downregulated genes in the hippocampus at P0. Genes in the prefrontal cortex that showed a significant alteration in expression included glutamate receptor interacting protein I, platelet factor 4, contactin 1, and neurotrophic tyrosine kinase receptor type 3. Important genes in the hippocampus that showed altered levels of expression included paralemmin 2, and protein tyrosine kinase 2 beta. In total, 40 different genes showed altered expression in the two areas at P0 after infection at E7 (first trimester), compared to 39 at E9, 676 at E16, and 247 at E18 (as found in previous studies). These altered expression levels most likely reflect altered neural organization. Importantly, HINI viral genes were not detected in either the placenta or brains of offspring whose mothers were infected at E7, suggesting that the virus did not cross the placenta to directly infect the offspring. This consequently implicates that the changes found in gene expression as well as the structural abnormalities of the placenta were most likely due to the production of maternal or fetal cytokines, most likely due to an increase in inflammatory cells in infected placenta. These data overall illustrate that viral infections during pregnancy can lead to an inflammatory response and structural abnormalities in the placenta. These structural abnormalities may cause significant alterations in oxygen and nutrients delivered to the fetus, causing abnormalities in the overall development of the fetus, including the brain. Could these organizational neural abnormalities lead to an increased risk for developing schizophrenia later in life? A next step for the authors would be to directly check the levels of cytokines in the placenta in order to assess the inflammatory response. Furthermore, are these results also found with infection of other viruses? Or are they more or less significant depending on the virus and time of infection? Hannah Ziobrowski is a senior at Vassar College, majoring in Neuroscience and Behavior. Every winter, the general public frantically agonizes over influenza prevention and protection. But is the purchase of hand sanitizer in bulk and tissue boxes by the dozen really necessary? After all, many people don’t even get sick during the winter months, and some just feel a little down for a couple of days. Why do some people catch “the flu” and end up in the hospital, fighting lung infections and plowing through boxes of tissues, while others just end up with a cough or runny nose? The answer may be come down to three letters. DNA. Recent research by Everitt et al. at the Wellcome Trust Sanger Institute (WTSI) has revealed that a single gene found in humans can determine your fate when infected with a variety of the most common strains of the influenza virus. The gene encodes the important protein referred to as IFITM3, a member of the interferon-inducible transmembrane protein family. These IFITM proteins have been shown to potently restrict the replication of a variety of pathogenic viruses, and IFITM3 has been shown to greatly alter the course of influenza infection in both mice and humans. Brass et al. previously identified IFITM3 through a functional genetic screen that indicated it mediated resistance to influenza A, dengue virus, and West Nile virus infection in vitro. This supported the hypothesis of the WTSI group (more than 30 authors! ), that IFITM proteins are critical for intrinsic resistance to these viruses, and allowed them to proceed with determining the effects of IFITM3 in vivo using mice. IFITM3 knockout mice showed severe signs of clinical illness, including massive body weight loss, rapid breathing, and piloerection (also known as “goosebumps”) when infected with low-pathogenecity strains of influenza that do not usually cause such intense symptoms. Their presentation of infection was more consistent with high-virulence strains of influenza. Contrary to the knockout mice, the wild-type mice shed significantly less of their body weight before fully recovering. With this significant data now being collected, the group moved on to testing their hypothesis that individuals who are homozygous dominant for the IFITM3 gene develop less virulent influenza infections. They sequenced the IFITM3 gene from 53 people who were hospitalized by the H1N1 or seasonal influenza infection during 2009 to 2010 to determine if they carried the wild-type gene or one with some polymorphism. Genetic analysis of a subset of these individuals showed no evidence of hidden population structure differences with respect to a 1000 genome control group from WTSI. In the hospitalized patients, the group found significant over-representation of a specific single nucleotide polymorphism (or SNP), referred to as SNP rs12252, that has a recessive C allele substituted for a normal dominant T allele. This leads to an ineffective IFITM3 variant lacking the first 21 amino acids of the protein. This recessive C variant leads to lower IFITM3 expression in the host and consequent increased susceptibility of the host to influenza infection, and is correlated with lower levels of IFITM3 protein expression. The group’s work has shown conclusively that IFITM3 expression can act as a barrier to influenza A virus infection both in vitro and in vivo, and that in vivo it can lower the mortality and morbidity associated with infection by a variety of human influenza viruses. Discovery of this innate resistance factor in humans may explain why encounters with a novel strain that may cause severe infections in others that do not affect you or your family. But can the IFITM3 gene be used to help develop treatments or vaccines for future influenza strain outbreaks? Is it possible to recover this gene, if an individual has an ineffective variant, through gene therapy so as to make someone more resistant to influenza? With more research being done on the genetic aspects of disease infection, many more questions will arise, and many more answers will as well! Jared Saunders is a junior at Vassar College, majoring in biochemistry. Avian influenza (H5N1) infections have about 60% mortality rate. Only around 600 people are known to have been infected, so it is still a very rare but certainly deadly disease. Those infected are individuals who have direct contact with infected birds. Although some cases of human-to-human transmission have been suspected, good evidence for this is lacking. Its an important virus in agriculture too. When H5N1 is identified in domestic birds, the usual response is a massive cull, resulting in millions of birds killed and farmers left in great financial difficulty. The question of whether such a virus could mutate to cause a human pandemic is an important one. In the history of flu pandemics, only H1, H2, or H3 viruses have been involved. Is it impossible for H5 to cause a pandemic, or has it simply not happened yet? If it could, would it retain the same level of pathogenicity, or in adapting to human-to-human transmission, would it become less virulent? To answer the question of the possibility of human-to-human transmission, some researchers in the Netherlands performed some experiment to evolve H5N1 to become more transmissible. They infected ferrets, and over several passages (moving the virus from one animal to the next) managed to encourage transmission between ferrets. The virus adapted to transmission between ferrets, changing slightly from the original virus. The changes are minor, only 5 mutations in 2 genes. However, this research has caused some significant concern: they have generated a transmissible form of a highly pathogenic virus. Is this a good idea? Importantly, the results have not been published so all this information is from news reports and interviews. Few people have seen the data. This is what scientists call “dual-purpose” research. On the one hand, it can answer important questions. On the other, it can lead to the development of biological weapons, ideas for biological weapons, or seriously bad accidents. The best science writers are having a hard time not sensationalizing this. Even the researcher who did it seems to be playing up the drama. What if it gets out? Millions will die! But is there a real risk from this virus? Its hard to know the facts without the published data. How well does the ferret model the pathogenicity and transmissibility in humans? It is commonly used and generally accepted to be quite good, but it seems a stretch to assume a human pandemic can occur based on transmission between ferrets in the lab. We need to be careful not to over-extend the findings of the study (this is especially the case since the data is not available). The experiment presumably shows that the virus can be transmitted between ferrets. It does not demonstrate that this virus can cause a human pandemic. How pathogenic is the new virus? Does it cause the same disease as the original virus or did the mutations that allow transmissibility also decrease virulence? Maybe it can spread human-to-human, but its not clear how sick they would get. Further, usually when a virus is passaged several times through a different host species, it adapts to that species and results in attenuation in the original host. This has been observed many times, and has even led to the development of several attenuated vaccines. Related to this, many evolutionary biologists believe that virulence and transmission are closely tied. That is, a virus that is too deadly will cause outbreaks that fizzle out (Ebola is a good example). Viruses that don’t cause enough disease might have a hard time transmitting too (coughing, sneezing or diarrhea are good examples – a little bit of disease helps get the virus out of your bod and into the next one). Paul Ewald argued that the high mortality rate of the 1918 influenza was in part due to the fact that the conditions at the time allowed for a more deadly virus to evolve. Due to WWI, factors such as overcrowding and troop movements may have allowed a highly virulent virus to be successful. Conditions today may not favor a pandemic by a highly virulent virus. So would a transmissible and pathogenic H5N1 cause a major epidemic or would it fizzle out? There is also the issue of publication. There is debate on whether the research should be published or kept secret. Does publication provide a roadmap for someone who wants to do this for evil purposes to repeat the experiment and create a biological weapon? It seems to me that even without details of the experiment, enough information is already available to repeat it. Withholding publication would also prevent other researchers from understanding and extending the findings. Any benefits from having done the experiments would be significantly less without publication. I have seen stories like this one before. Several years ago, an highly pathogenic ectromelia virus (causes mousepox, related to the smallpox virus) was made by adding the gene for Interleukin-4. The researchers did not intend to make a highly pathogenic virus, it was rather a surprise to see this effect. There was much debate about whether they should publish, that perhaps this was a roadmap for building a highly pathogenic poxvirus in humans. They published and we have since learned more about the virus, including the observation that the virus does not transmit effectively, and that doing the same thing in other viruses doesn’t have the same effect. The more we know, the better. I’d make the same argument here. I’d like to see the research published. The information from this study is probably valuable, addresses an important question, and is only one small step in understanding H5N1 influenza. There is a photo circulating on Facebook that shows the package insert for a flu vaccine that appears to indicate that the vaccine has not been shown to be effective against influenza. Of course, this has gone viral, (sorry for the pun) especially among the anti-vax crowd. Its the last statement that has triggered concern: no controlled trials adequately demonstrate a decrease of influenza disease after vaccination? Sounds bad, so lets take a look. The package insert actually has 14 pages. They show the results from a 2005-2006 clinical study involving 7482 people. About half received the vaccine and half received a placebo. Then they followed those individuals to see who got the flu. 23 people receiving the vaccine got a strain of flu against which the vaccine is supposed to protect. 45 receiving the placebo got those same strains of the flu. The statistical analysis shows a vaccine efficacy of about 46%, but the calculation of the confidence interval suggests the efficacy could be as low as 9.8%. Before doing the clinical study, they decided that the lowest limit of the confidence interval had to be above 35% to be considered successful. So it seems that the statement that clinical trials have failed to show efficacy is correct due to the large error range in their data. Lets consider the other statement, that FLULAVAL is indicated based on it eliciting an immune response. Data from another study is shown in which people were given the vaccine and after 2 weeks, then checked for production of antibodies. In this study the levels of antibody increased to high enough levels in enough individuals that the vaccine met the criteria for success. Furthermore, they did a test called an Immunological Non-Inferiority test. Basically, they wanted to know if FLULAVAL induces an antibody response that is at least as good (ie not inferior to) another vaccine available on the market, FLUZONE. FLULAVAL induced as good a response as FLUZONE. (If you take a look at the FLUZONE package insert, they only report data on antibody responses, and state that no data is available on whether FLUZONE reduces incidence of influenza). So there appears to be something of a conflict: the clinical trial was not successful but the vaccine appears to induce an appropriate response. Perhaps the measurement of antibodies is not the ideal indicator for predicting protection? This speaks to an important question in vaccine development, which is determining the correlates of protection. That is, what specific part of the immune response is needed for immunity? Lets also look at other flu vaccines. FLULAVAL is one of seven different flu vaccines available. Fluarix: Clinical studies show a reduction in influenza disease in vaccinated vs placebo groups. FluMist: Clinical studies show a reduction in influenza disease in vaccinated vs placebo groups. The data for FluMist are the most impressive, getting as high as 96% efficacy with certain flu strains. FluVirin: Only shows immunogenicity data, induces antibody response that exceeds the threshold defined for success. FLUZONE: Only shows immunogenicity data, induces antibody response that exceeds the threshold defined for success. Afluria: Only shows immunogenicity data, induces antibody response that exceeds the threshold defined for success. Agriflu: Clinical studies show a reduction in influenza disease in vaccinated vs placebo groups. Interestingly, it appears that approval of flu vaccines is based on showing that the vaccine can induce a strong antibody response, not showing that the vaccine prevents the disease. Package inserts don’t communicate the whole story. We also have to consider the total body of evidence, not just one or two tests. There are many other clinical trials demonstrating the efficacy of flu vaccines. Such as this one, this one, this one, and this one. In the clinical trials described in the package inserts, the severity of disease is not indicated. Did the vaccinated people get less severe disease than the non-vaccinated people? A vaccine that induces sufficient immunity so that it prevents severe disease although you might still get a sniffle, would still be pretty good. There are other outcomes to consider too. Does the vaccine reduce transmission or complications following influenza disease? In Canada, Ontario made efforts to dramatically increase influenza vaccination, with the result of reduced influenza associated mortality and reduced healthcare use. And take this study in which it was found that vaccination of healthcare workers didn’t reduce incidence of flu in those vaccinated but reduced the mortality rate of their patients. There is an obvious need for a flu vaccine that induces better protection, especially in children and the elderly, and ideally, one that is universal so we dont have to go every year to get a shot and dont have to depend on predictions of what is going to circulate in the future. But the evidence that the flu vaccine is beneficial for individuals and society is pretty strong. Finally, I think this emphasizes the importance of digging deeper to understand the information around us. It is never as simple as it seems and we must avoid reducing information to the simplest single sentence thus removing the underlying complexities. Disclaimer: I am “not that kind of doctor” so this is not intended to provide any medical advice or recommendations for which vaccine to use. Swine Flu: New and Improved! Flu season is never enjoyable, but some seasons are certainly worse than others. The 2009 swine flu outbreak was particularly serious because the 2009 H1N1 strain was a novel virus, formed via the reassortment of swine, avian and human flu viruses. There were over 600,000 confirmed cases of H1N1 and over 18,449 deaths during the course of the pandemic. While this sounds pretty bad, it could have been much worse. The transmission efficiency of H1N1 was actually much lower than those of other pandemic strains, such as the 1918 H1N1 strain. Unfortunately, recent research demonstrates that this could change. Flu strains are characterized by the hemagglutinin and neuraminidase found on their surfaces, hence names like H1N1. In order for the virus to infect a cell, hemagglutinin on the surface of the virus must bind to glycan receptors on the cell. Therefore, to explain the low transmission efficiency of 2009 H1N1, researchers looked to its hemagglutinin. In most flu strains, the amino acids at positions 219 and 227 within the hemagglutinin are both hydrophobic or both charged. In 1918 H1N1 both are hydrophobic. However, the 2009 H1N1 strain has isolucine, a hydrophobic molecule, in position 219 and glutamic acid, a charged molecule, in position 227. Researchers hypothesized that lacking either hydrophobic or ionic interactions at these positions would disrupt the positioning of neighboring residues and decrease the hemagglutinin’s binding affinity. They further hypothesized that if they replaced isolucine with the charged amino acid lysine, stable inter-residue interactions would occur and binding affinity would increase. When researchers compared the ability of wild type and isolucine→lysine mutant strains to bind to an array of glycans representing human binding sites, they found the binding ability of the mutant strain was 30 times greater. The mutant version also bound more intensely to receptors in human tracheal tissue. Researchers also infected ferrets (commonly used as models in human influenza studies) with either wild type or mutant virus. Only the ferrets infected with mutant virus spread the infection to all of the previously uninfected ferrets placed in close proximity to them. The mutation of just one amino acid could greatly impact the transmission efficiency of 2009 H1N1. Flu viruses tend to mutate frequently, which is why a new vaccine needs to be developed every year. Predicting what these mutations will be is not an easy task, but mutations at the positions in this study will certainly be monitored closely. Can miRNAs help further attenuate influenza A vaccines? MicroRNA (miRNA) molecules, first characterized in the early 1990s, have been implicated in a variety of different biological mechanisms. It took almost a decade for researchers to detect and understand the role of miRNAs in regulation of translation. Since then, research has focused on how we can scientifically manipulate these regulating molecules to our advantage in order to further understand biological underpinnings of certain diseases, as well as potential miRNA-based therapies. The ability of the influenza virus to undergo frequent and substantial genomic mutations forces us to continually monitor its prevalence, and modify yearly vaccines to target the prevailing viral strains. Recently, live attenuated influenza vaccines (LAIVs, e.g. FluMist) have been proven effective, and have been distributed to a large portion of the eligible population to combat the seasonal flu. These vaccines are manipulated to become much more temperature-sensitive, and therefore are only capable of replicating in temperatures found in the nose. The inability of these attenuated viruses to replicate in the respiratory tract (due to higher temperatures) allows the vaccinated individual to produce antibodies to the influenza strains in the vaccine from the infection in the nasal passage. Therefore, the individual can produce the correct immune response without the virus spreading to the respiratory tract and causing symptoms. In 2009, a group of researchers from Mount Sinai School of Medicine found that using microRNA response elements (MREs) can supplement the effectiveness of LAIVs. In the study, the MREs for the miR-124 (neural tissue-specific) and miR-93 (a ubiquitous miRNA) were inserted into open reading frames of influenza A nucleoprotein coding regions. The investigators vaccinated mice with miR-93-seeded strains, and then inoculated them with a lethal dose of influenza A/PR/8/34 H1N1 21 days later. This resulted in 100% survival of the subjects, as well as a robust immune response. In an attempt to attribute these results to other influenza strains, the same experiment was done with H5N1 (MREs were inserted into the vaccine specific for H5N1, and methods were repeated). Subjects who had received mock vaccinations 21 days prior to being inoculated with H5N1 displayed rapid weight loss, as well as 100% mortality. On the other hand, mice that had received the MRE-containing H5N1 strain did not display any signs of disease. Furthermore, serum from these subjects exhibited neutralizing activity against the wild-type H5N1, and a wide array of antibody responses (high levels of IgM, IgG1, IgG2a and IgG2b). The results from this study lead the researchers to believe that MRE-containing LAIVs can be used, and potentially be even more effective than currently available LAIVs in protecting against influenza A outbreaks. In addition, this technology provides the potential to control for the degree of attenuation of the vaccine by manipulating the number of MREs/miRNAs. Lastly, FluMist – although proven to be equally as effective as injected vaccines – has some age exclusions. Perhaps the addition of MREs/miRNAs could expand the target demographic of this method of vaccination. Ekybion: Inhibitor of influenza or immune-response? Ekybion is a drug complex that was developed to treat inflammation in the respiratory tract caused by infectious agents. A series of experiments were implemented to test if Ekybion was capable of inhibiting the growth of influenza A/PR/8/34 H1N1 strain in vivo (mice). The first experiment was performed in vitro. MDCK cells were treated with Ekybion 1 hour pre-infection, 1, 2, 4, or 12 hours post-infection. Samples of the different cultures were taken 24 and 48 hours after infection and the number of influenza viruses were counted using the hemagglutination assay method. The results showed that the treatment of MDCK cells (whether pre/post infection) significantly reduced viral growth for at least 48 hours and that pre-infection treatment was most efficient. The first experiment done in vivo was testing the possible toxicity of Ekybion. They treated one of two groups of mice three times a day with Ekybion. The toxicity was determined by the mice’s weight and normalcy of lung tissue. The test was done with several different concentrations of Ekybion. The results showed that no toxicity was observed in the treated mice until 50x concentration level was reached – indicating that no toxicity would result from Ekybion use at 1x (concentration intended for medical use). Ekybion’s inhibition of the virus in infected mice was tested at different treatment times and concentrations. Mice were weighted daily for 16 days and 2-5 mice were euthanized from each group on the second day post-infection to determine the amount of virus in lung tissue. The results showed no significant differences in weight loss and that the treatment with 1x concentration for 2 minutes was the most effective with a 46% survival rate (compared to 0% survival in the control). The lung tissues collected from the euthanized mice were used to determine cytokine levels at the site of infection. The results showed that mice treated with Ekybion had a lower cytokine quantity. This determined that Ekybion could suppress immune response as well as reduce viral growth. The question resulting from the experiments is whether or not the anti-viral benefits outweigh the immunosuppression effect of the drug. Enveloped viruses have developed a clever technique to enter host cells and release viral genome into the cell for replication. In order to enter the cell, a virus particle takes advantage of the endosomal transport system, in which large particles bud into the cell after being enclosed by a section of the cell’s lipid membrane. Then, the acidic environment of the endosome provides the cellular energy needed to fuse the viral membrane. This process requires energy because it involves changing the conformation of the viral membrane to bend it towards the lipid membrane enclosing it. Clearly, membrane fusion is an essential part of the viral life cycle as it is the only way viral genome can be released into the host cell. As a result, lots of recent research has been directed at identifying molecules that effectively inhibit membrane fusion. A crystallography study has helped to elucidate the mechanism by which tert-butyl hydroquinone (TBHQ), a small molecular compound that binds to influenza HA envelope protein, inhibits membrane fusion and reduces viral infectivity. Unfortunately, TBHQ only works on influenza group 2 subtypes (e.g., H3 or H14), which have a special hydrophobic binding pocket for the molecule. Once there, TBHQ works as a kind of “molecular glue,” stabilizing the structural conformation of the HA envelope protein. As a result, the amount of energy required for membrane fusion is increased to the point that HA is unresponsive to the acidic environment of the endosome. The findings of this study may provide a framework for structural design of effective membrane fusion inhibitors for use as therapeutics against enveloped viruses. Molecular compounds that are structurally similar to TBHQ are both easier to synthesize and have more drug-like chemical properties than other types of membrane fusion inhibitors (e.g., enfurvirtide, an HIV-1 membrane fusion inhibitor). However, it is important to remember that the TBHQ binding site is only one possibility for such conformation-locking molecules. Further research should explore alternative sites, and also explore the problem of viral resistance developing against TBHQ inhibition of membrane fusion.